Bosses are meant to be those professionals who are constantly looking for ways to make the company better and are always trying their level best to ensure that the employees are working as a unit rather than separate factions. Bosses are expected to be above petty politics and are always supposed to be fair as well as ever sensitive to the needs of their employees. Yet sometimes it might just happen that a boss might not be quite and might even go so far as to dislike, disrespect and even hate few employees. Following mentioned are few signs your boss hates you or doesn’t respect you. 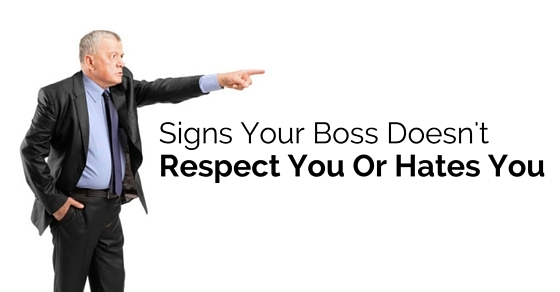 Given here are some main signs to tell whether your boss doesn’t respect or even hates you! No matter what your position in the company is, the boss, who hates you is going to just end up undermining you authority. He is likely to do this even if it happens to be in front of workers who are your subordinates. The ways in which he can undermine your authority is by going against what orders you have given your team, or encouraging your team members to go against what you have told them. Things like this not only get extremely frustrating but they also might play on your emotions as well. So you should try your best to keep a cool head under the given circumstances and continue to unit your work force no matter what the odds are. One of the simplest ways to know whether your boss respects you as both an individual as well as a skilled professional is the manner in which he responds to things which you say. Someone who values what you say will never interrupt you and will never tell you to keep shut. A person who hates you and does not respect you will constantly do the above and even go so far as to countering every suggestion which you give. So if you make a note that your boss is constantly looking for ways to silence you and make you keep your views, ideas and opinions to yourself, then it is easy for you to tell that he is not very fond of you. A boss will always look to promote a worker who he likes and thinks is an asset to the company. Things like being over looked for a promotion once or twice in the course of your career, does happen. Yet if you notice, that no matter what you do, your boss is simply not willing to give you the promotion which should rightfully have been given to you then that is a sure sign that he does not respect you and even hates you. The greatest way for a boss to show that he looks upon someone with disfavor is if he passes on a much deserved promotion from someone who is the obvious candidate, to someone who is not the best. In the event of there being some important function taking place or some emergency arising, a boss is likely to make a special core committee and discuss pressing issues with them. A sure sign that your boss does not respect you or hates you, is if he constantly makes it a point to not call you to one of these meetings and allots you no responsibility even if your position in the company is rather high and everyone at your level was invited to be a part of the discussion. Things like this are sure to hurt you and you can be rest assured that your boss is making a deliberate effort to leave you out because he doesn’t like you! As an employee in a top company, it is needless to mention that you will always strive to give up good quality work so that you are able to impress your seniors and even your boss. If you get the feeling that no matter how perfect the work which you do is or how much effort you put into your project, your boss is simply never content, then that is a sure way of knowing that your boss does not respect you and hates you. A person who respects you and looks upon you favorably will always try to encourage you and even state the positives about your work instead of simply focusing on the one thing which you didn’t do. Technology is something which none of us can do without. It is something which everyone in a company relies on, to function in a proper manner. Bosses use it to keep in touch with subordinates and subordinates use it as a medium to communicate things to the seniors. If you note that no matter what, your boss never talks to you in person and will only communicate with you via electronic means then that is something which is a sure sign that he does not respect you and hates you. Yet before coming to this conclusion, ensure whether your boss does this with only you or whether everyone in the company gets the same treatment. None of us are perfect and at some point in time, all of us make mistakes no matter how good we are at doing a particular thing or performing a particular task. One sign that your boss does not respect you and hates you is that if he shouts at you when you happen to make even the smallest of mistakes in your work. Bosses are known to lose their temper since they have so many things to deal with and because they are under a lot of pressure, yet if he only shouts at you, in a disrespectful and uncalled manner, then you are sure to detect his hatred for you. If you observe that your boss, who is otherwise a rather jovial man, never smiles at you then that is sure because he neither respects you or likes you as a person. A simple smile from a boss can go a long way in encouraging an employee to do better and feel important. You need not go out of your way to find a reason why your boss acts in this manner as chances are that if you have not done anything wrong, then your boss is just a petty individual who decides arbitrarily who he likes and who he does not. As long as you continue to do your work well and carry out all the instructions given to you properly then you need not worry about anything at all. A boss who does not respect you or hates you will use his authority and position to turn the others in the company against you and to get people to make a laughing stock of you. A sure sign that your boss feels this way about you is if he makes hurtful and rude jokes at your expense to make you feel bad and taunt you. If you want to find out what the reason behind him acting in this manner then you can go and ask him in a polite manner about why he does this. Standing for yourself is something you should not be afraid of. Bosses are usually those people who have so much on their plates that they leave it to the managers to micromanage employees rather than attempting to do so themselves. If you see that your boss makes it his business to the only micromanage you and even hen pecks you for every little thing then you can rest assured that this is because he does not respect you and does not trust you enough to carry out your responsibilities in a proper and perfect manner. A person who has full faith in you will leave you to your own devices and allows you to take decisions which you think will benefit the company. A sign of a good boss is that he or she takes a personal interest in the employees and even goes so far as to make a personal rapport with each employee. You can tell your boss does not respect you at all and even hates you if he tries to avoid you at all costs. If you walk into a room, he will walk out, if you step into the elevator he will step out, if you wish him, he will pretend he did not hear. He might not notice you maybe once or even twice, yet if you notice that it is a rather recurrent thing, where he almost acts as though you are invisible and inconsequential, then that is one of the main signs. As mentioned above a boss who hates you and does not respect you will do his best to taunt you and will even get others at the office to do the same. Taking advantage of his position of authority, he will even make it a point to make you do unfavorable tasks which no one else in the company will be willing to take up. He might think it is funny to do this and to see you sad and miserable or he might even want to push you to the edge so that you succumb and accept defeat. You should try your level best to have your head on your shoulders and deal with situations like this as best you can. A boss who does not respect your or who hates you will always make up an excuse not to talk to you and will always be too busy when you have to share a problem with him or state some grievance to him. No doubt bosses are meant to be figures of authority but they must make it a point to be available for their employees. Body language is very telling indeed and if you notice that the body language of your boss negative towards you and rather uninviting then that is a sure sign that he doesn’t respect you or hates you. Sometimes gut feelings are the most powerful. It might happen that you may not be able to put it in words how you know that your boss does not like you or respect you but the manner in which he makes you feel by his actions will make you confident about his disfavor towards you. So these are some of the chief and most telling signs which you ought to keep an eye out for, if you are in doubt about how your boss behaves towards you. What you ought to remember is that some bosses are just generally cold and distant and they have nothing personal against you. They think that it is better to maintain a professional distance with the employees otherwise things might become out of hand entirely. Yet if you see that things are going out of hand then you need not feel bad about handing in your resignation no matter what. You should work in an environment where you feel both respected and valued.